Mother and daughter share a hug in a photo as Brooke performs "My Mother Has 4 Noses," coming to The Duke Off-Broadway. 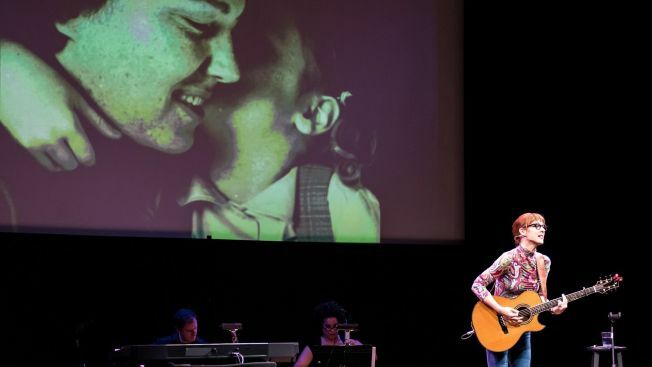 Jonatha Brooke, the Boston-raised singer and songwriter whose albums such as “Plumb” and “Steady Pull” have won her a legion of fans, will begin performances of a new musical play on Valentine's Day about her mother’s two-year struggle with Alzheimer’s disease. “My Mother Has 4 Noses” is slated for a limited run through May 4 at The Duke on 42nd Street. Written and performed by Brooke, it’s directed by Jeremy B. Cohen, artistic director at the Playwrights’ Center in Minneapolis. Opening night is set for Feb. 20. Brooke’s mother was a published poet and a Christian Scientist. As her mother’s illness progressed, Brooke began chronicling her experiences — she calls it “the daily theater of loving and caring for someone with dementia” — and her writings became a popular blog, before evolving into a collection of 11 new songs. After readings around the country, this staged adaptation debuted last June at the Warner Theatre in Torrington, Conn. A four-performance run in Minneapolis followed, as did shows at the Philadelphia Fringe Festival, and then the Guthrie Theater’s Dowling Studio in Minneapolis. Brooke explains more in a teaser video for the upcoming show, below. “My Mother Has 4 Noses,” through May 4 at The Duke on 42nd Street, 229 W. 42nd St. Tickets: $70. Call 646-223-3010, or visit www.dukeon42.org/Shows/2014/4Noses.aspx.